With the rising cost of electrical energy there is growing pressure to use it as efficiently as possible. This fact significantly affects trends in the development of new technologies, including compression and air treatment. More efficient compression and efficient use of electrical energy = money saved. When air is compressed, most of the electrical energy is converted into heat. When starting to develop the new range of SMARTRONIC compressors the idea was to reduce the percentage of electrical energy that is converted into heat and to use the heat generated, despite efforts to reduce it, so as to build a machine that would meet the requirements of the current trends. One bonus is the use of compressed air technology in a pressure vessel, which in standard machines is discharged into the atmosphere when the compressor discharges, resulting in a significant loss. This is as much as 20% of the compressor output!! This integrated compressor station with adsorption dryer and intelligent management and diagnostics system represents a completely new standard in the generation of compressed air. Conveniently placing parts in a common housing has resulted in an integrated compressor station which is easy to connect up to air conditioning. A major benefit as regards the economical operation and reliability of the machine is also greater cooling efficiency. Revolutionary drying and control over the quality of output compressed air. Management of energy consumption and maximal utilization of energy that would otherwise be wasted. Diagnostics and management of operating conditions such as prevention, increased efficiency and extended service lifetime. Modern and highly efficient components (new 5th generation block A150). Remote control and reporting for increased safety and faster solutions. Universal installation dimensions and variability. 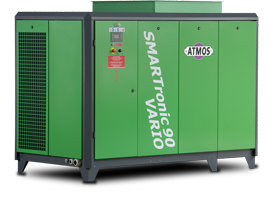 SMARTRONIC is a new series of oil-lubricated screw compressors with an output of 30 kW to 110 kW with an integrated Fusion Dryer that uses waste heat from the compressor and exhaust technological air. The achievable dew point temperature is in the range of +5 ° C to -20 ° C or -40 ° C. The whole machine is controlled by a central control system from a single control panel with the support of sophisticated diagnostics. A "complete compressor station on a dime", so to speak. Unit performance measured according to ISO 1217, Annex C.
In the version with integrated fusion dryer is a discharge pressure up to 0.5 barg lower. Fusion dryer is not available for machines ST90 and ST90 Vario.